leave that to artisans more experienced than I.
to do, but I soon enjoyed the extra time this gave me. favorite so I’ll keep making it for him for as long as he wants. good you may forget about the rest of your baking – fair warning. cookie sheet to catch any over enthusiastic butter sputters. pick inserted in the middle of the cake comes out clean. of the cake with a small sharp knife. cake. Remove pan and enjoy! making and this version does just that. but sassy and presents are strewn all over. The mess can wait until after New Year. never is, but I am so very happy where I am. you love this Christmas weekend!! A delicious cake! i've always loved it. Such wisdom, it's not taken away, just let go … time to do nothing with those you love, that's the best … well it's right up there with this pineapple upside-down! Both are excellent! Blessed Christmas to you and your loved ones, Joey! Here's to a fabulous 2012!! I hope you're having a blessed and joyful Christmas season, Joey! And eating loads of delicious food, your cake included! Hi Mom-Friday! Merry Christmas to you too and all the best for the New Year! This version is really sweet and buttery…hope you like it! Hi Rosa! Happy holidays to you! Hi Tanna! Sometimes it's all in the way you look at it…and taking the time to relax and appreciate things 🙂 Happy holidays! Hi Ling! Hope you had a great Christmas and best wishes for the New Year! Hi Midge! This is such a homespun sort of cake right? 🙂 And very nostalgic for a lot of people! Hope you had a lovely Christmas and a happy New Year to you and your family! Hi Katrina! Nice coincidence 🙂 This cake is so nostalgic in its very essence I think, and although it isn't very "trendy" to make it is always so appreciated when it's around 🙂 Hope your holidays were equally wonderful and filled to the brim with deliciousness! I really want to try this – it looks and sounds delicious! This looks great! I love food blogs!!! Have you checked out Katie Girl Cooking? This looks fantastic! So refreshing to see pineapple on a blustery and cold winter morning. Delicious! Can't wait to try this one! in the oven…can't resist not trying it after i've gone back looking at the pictures again and again and again. :-) hope it turns out just like yours. Hello, Joey! My wife baked this a few days ago and it was just glorious! Shared the recipe too in my FB account. Thank you so much. WoW! Such a delicious cake! I also love it. This is yummy post for me..
do you even realise what a crime you have done- this is a staple in my house now! my cake hater husband devour it.it is indeed like candy- just melts in your mouth. Made this today….OMG it was so good and so easy!!! Thank you for the recipe. Looks so delish!! I am going to attempt this tomorrow. Is it the type of cake that needs to be eaten the same day as I want to make this ahead of time for Christmas. I followed the recipe exactly and we didn't really like it. It tasted like pineapple flavored butter. Way too much butter for us. can you give me the conversion to cups for the grams – the closest you can get as every conversion page I try gives me a different ammount. I tried the recipe and the cake part didn't raise up at all. Help please. Hi Catherine! Wish I could be more help but I don't have an exact conversion for this recipe…I usually also rely on researching over the web for cup-gram conversions. This cake doesn't rise that much though…hope you still enjoyed it! 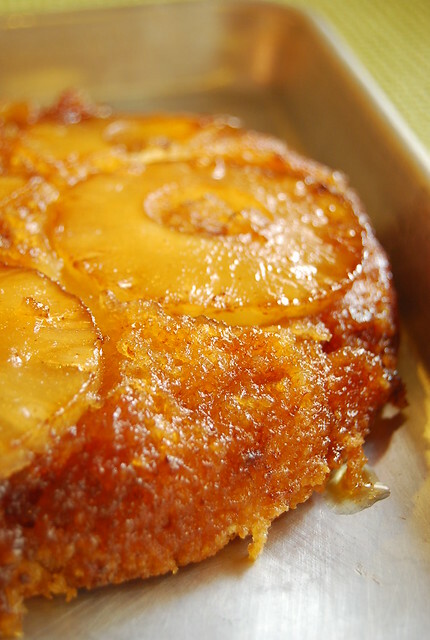 My husband requested a pineapple upside down cake for his birthday, so we used this recipe. Thank you for sharing your knowledge, the browned butter definitely gave it an extra layer of deliciousness. No conversion from grams to cups?? Every website has a different conversion, too bad, i really wanted to try this recipe. I gues i have to break down and buy a scale. Cake is beautiful. I wish I could upload a picture. Looking forward to tasting it. I just had a slice. It is really delicious. Buttery and sweet but in a good way – although initially I was afraid it might be too rich. I love it. Next time though, I may double recipe and make it in a 9 inch pan, or triple it for a 9×13 pan. I like the fact that the ratio of cake to the pineapple topping is smaller. I think that when there is too much cake it somehow waters down the topping goodness. Your version does not do that. Thanks.